With Stata's power, you can compute power, sample size, and effect size. Enter any two and get the third. 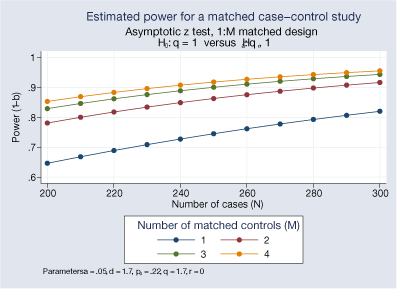 Among other new features, power now provides power and sample size for matched case–control studies. and learn that we need 285 cases and 285 controls. 1:M matching is often used to reduce the required number of cases because cases are often more difficult to obtain than controls. It is thus useful to evaluate designs with different values of M.
Upgrade now Order Stata Read even more about power analysis for survival analysis and contingency tables.